The BCL-3000 is Tecsun’s upgrade to the very popular and still available BCL-2000. For reference purposes the BCL-2000 is the OEM version of the Grundig S350 sold in North America. It is also sold under other brand names in other countries. In a nutshell the original BCL-2000 is an analog-tuned radio with digital frequency readout, covering AM/FM and SW. The newer BCL-3000 will be marketed in North America as the Grundig S350DL and will retail for $150 compared with the S-350′s $100 retail price. The Tecsun version for this review was purchased through Liypn on eBay for $50.90 plus $38.00 shipping & insurance for a grand total of $88.90. This compares with the approximate price of $70 for the original version. 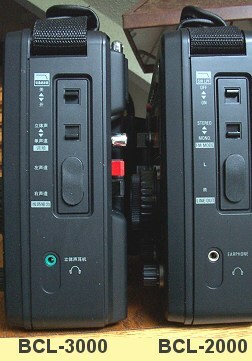 Although the North American Grundig version sports updated styling with chrome accents, making it look very different than the original, the Tecsun looks identical to the original model with the exception of different characters on the LCD display…the radio cabinet itself appears to be identical. One other difference is that the Grundig S-350DL will reportedly allow the use of either AA or D cells…the Tecsun runs on 4 D cells or AC power only. The Tecsun versions also omit the expanded AM band which is, of course, covered by the Grundig version. The original models offer a lot of performance for the price. Very good sensitivity, decent selectivity and pleasant sound in an easy-to-carry package. Being a single-conversion design there are some out of band images but these tend to not interfere very often while tuning within the usual SW broadcast bands. Auto Backlight feature added…operating the controls turns the illumination on for a few seconds.FM Stereo is now available at the headphone jack (it was only available at the Line Out jacks of the original model). The Time can now be set with the radio either on or off.Improved action of RF Gain control (not a claimed improvement but I noted it in my comparison tests). And the biggie…an “Automatic Frequency Lock Up Function” has been added. I spent a couple of days comparing my BCL-3000 to a BCL-2000 to see how these new features worked and came away feeling the new model is an advancement, but that it also has some quirks not present on the original model. The Snooze, auto backlight and FM Stereo upgrades are simple enough and don’t need much discussion here. But the biggest reason I tried this new model was to see if the well-documented drift issues of the original model have been improved. What I found was that frequency stability has been improved noticeably but it comes at the expense of some ergonomic friendliness. Here’s how the new lock feature works and what I found. As you tune in a station, the MHz or KHz character on the LCD readout flashes as you tune. A second or so after you stop tuning, that flashing stops and the radio locks on the frequency you’ve tuned in. So far so good and it looks very re-assuring. The downside is that while you are tuning, if you have trouble zeroing in on the exact frequency right away, it may lock before you have finished tuning…then it tries to keep the frequency from changing while you are still tuning and will fight you until you tune far enough away to “lose lock”. You have to tune further away than you would want to, then come back to the right frequency, and land on it before it locks again. It can be tricky, especially on shortwave, where the radio is still somewhat finicky to tune in exactly. It’s less of an issue on AM than it is on SW. 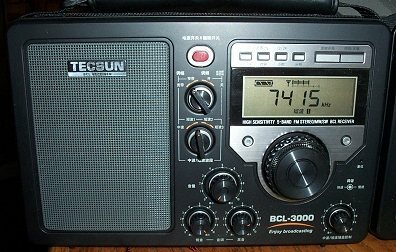 Comparing a BCL-2000 with a 3000, the 3000 forces you to tune fast enough to keep the radio from locking before you’re done zeroing in on the exact frequency and although it sounds a bit odd it can be tricky. I also discovered that the actual drift, which is caused by a combination of mechanical backlash in the tuning system and some electronic drift as well, has not been eliminated. Rather, the automatic frequency lock circuit has been clamped down on top of it. What this means is that small amounts of drift will be held in check by the new lock circuitry, but if the radio drifts beyond a certain amount the radio will lose lock and the frequency will drift, although it will drift less than the original model by a factor of about 2 to 1. That is, if my BCL-2000 drifted from 12095 to 12090, the BCL-3000 will only have drifted down to about 12093. Hz and it locked on. After a while I came back and the radio had drifted to 709 (admittedly not bad), and the KHz indicator was flashing. My BCL2000 had drifted to 708 by comparison. However, on the BCL-2000 is was a simple matter to tune upward slightly until the radio was back on 710. But with the 3000, as I started to tune upwards, the frequency stubbornly stayed on 709 until it suddenly jumped up to 712. So I started to tune downwards and it held on 712 until it would drop down to 708. I could not get it back to 710. I had to tune away somewhat further, then come back to 710. This behavior is a little frustrating to those who enjoy analog tuning…as you tune across any AM or SW signals, the speed at which you tune determines whether or not the BCL3000 will lock onto a particular frequency and fight you until you force it to unlock by tuning further away then you normally would. (To Tecsun: Perhaps if the lock could be modified to wait a second or two longer before clamping down it would alleviate this problem). On a more positive note, I did several comparisons of AM and SW drift on the BCL-3000 versus the BCL-2000 and the 3000 always remained much closer to the originally tuned frequency, and often held it perfectly, while the 2000 might waver around a bit. So it is better in this regard. It’s just too bad that this tuning behavior is more finicky that it was before and I think this kind of idiosyncrasy will bother some users. It is also obvious that while the new lock circuit is an overall improvement, it is not as desirable as eliminating the actual drift at its source would have been, and is therefore more of a band-aid approach to dealing with the problem. And it is certainly true that once tuned to a frequency, the BCL-3000 will remain closer to that frequency than the 2000 will so in that regard, the lock circuitry is doing exactly what it is claimed to do. For perspective, even the original models could be controlled if you learned the ins-and-outs of them. For instance, since some of the drift is actually the release of forces which are stored in the tuning mechanism, learning the “feel” of that mechanism lets you keep drift to a minimum. As you zero in on your station, swinging the tuning knob in smaller and smaller swings to either side of the correct frequency, finally zeroing in on the exact frequency you can leave the tuning system with less built up tension and it will “creep” less afterwards. Also, if you are using the radio on batteries (where the drift is greater than on AC because in AC operation one critical component is kept at operating temperature all the time), drift stabilizes after the first several minutes of operation. In fact, I can keep a BCL-2000 tuned to one AM frequency without ever touching it day after day and the maximum deviation I will ever see is 1KHz, which is actually very good. Again, SW tuning is more critical and drift is more evident, but you will have to retune more often on the original model than the newer one. One other complaint on the original model was the sudden operation of the RF gain control. As you rotated it counterclockwise nothing seemed to change until the last few degrees of rotation, then all the change occurred with very few degrees of rotation. The new model features a much more linear, smoothly acting control, although it has a bit less ultimate attenuation than the original For most uses, however it is greatly improved. One note applicable to all versions…if you are experiencing a bit of overload on SW, try shortening the rod antenna to about half of its full height. I find this more effective than either the RF Gain control or the Low Pass Filter in many cases. The auto off feature now ‘remembers” the last time setting you chose, so instead of always defaulting to 90 minutes, it will start wherever you last used it. In other words, if you set the shut off time to 60 minutes, it will be 60 the next time you engage it, unless you then change it…a nice feature. You can still bypass the auto shut off mode by holding the power button for a few seconds as on the more recent BCL-2000′s. However, to turn the radio off you have to hold the power button for a few seconds…a quick push will not turn it off. On the BCL-2000 if you hit the light button momentarily the light will come on for a few seconds, then turn off. Or you can hold the light button for a few seconds and it will stay on permanently. On the new model, you have to hold the button while the light cycles on, then off, then back on before it will be permanently on. And to shut it off, instead of the single punch of the original model, you have to press and hold the switch for a few seconds to turn it off. Same with the power button. Once the radio is on, you have to press and hold it for a few seconds to shut it off. Not big issues…just oddities compared with the original model. I should also mention that I found no differences in overall performance between the old and new models. They seemed equally sensitive on all bands and had the same sound quality. It is clearly updated software which makes all the difference in the new model. So Is The Upgrade Worth It? In conclusion it is clear the Tecsun’s engineers sought to improve an already good model with what is essentially a new software interface. The basic radio is unchanged, but the software allows new features to be added. These new features probably add more than they take away, but if you already are a happy owner of an original model Tecsun BCL-2000 or Grundig S-350 it’s hard to recommend buying the upgraded version just to have the upgrades. For a first time buyer I would recommend the new version because it is overall a bit better, but whether or not it justifies the increased cost $150 versus $100 for the two Grundig versions) will be a personal decision. Click below to see it at Amazon.